In 1939-1940, the Jewish volunteers from all nationalities et from all parts of the world ran to serve France. Many left their lives in the ranks of the old unities of our Army, as well as those in the young regiments of the foreign volunteers. Many continued to serve and die among the “free French” or in the cohorts of the “Forces Françaises de l’Intérieure” (one of the partisans groups), and I could not forget those who I had the honour to lead in 1943 and 1944 on our invaded soil. From Tunis to the heart of Germany they participated with glory to liberation campaigns. Shoulder to shoulder with those of all spiritual faiths, all parties in love with freedom, they were together, the good workmen of the outliving of France. Your homage to the Jewish volunteers and veterans of WW2 applies to all of them, discarding which they belonged to. Neither should it be question to distinguish among the dead. United they lived in perils and united in sacrifice, they remain united in our spirit and our heart. Some fell gloriously in the battle fields or in the combats of the Resistance , the others have perished in the darkness of prisons or concentration camps, but all died for France. It was not the first time that Foreign Jews ran to serve our attacked country; those of 1939-1945 followed the example of their elder from 1914-1918. 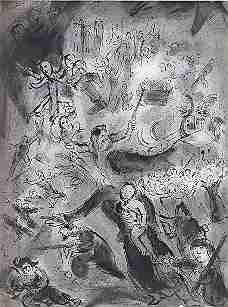 Likethem, spontaneously and simply they came at the time of danger to offer totally their existence. This sublime motion, twice happening, reveals highly the intensity of the love that our Jewish brothers have for France together with the immense gratitude they feel for the generous country of Human Rights. One says with reason that “any man has two countries, his own and France”. The Jewish volunteers and veterans proved it with grandeur: by engaging and dying for France. The Jews who volunteered during ww2 and who fought in the march regiments or in the partisan groups had different origins or believes. Russians, Poles, Czechs, Greeks or Turks, liberals or conservatives, socialists or communists, assimilationists or Zionists they had in common their jewish ascendance and their horror of the nazi tyranny. And the Gestapo who tortured their family did not make any subtle difference between their origin or ideology. They were all united in the resistance. United they remained in suffering. You are right to commemorate their heroism and their martyrdom. You are right even more when you keep them united in the tribute that you dedicate them, without any partisan concerns. With fervour I concur with your enterprise I address to you my best feelings. Foreign volunteers engaged in the 39-40 fights counted in their ranks very numerous Jewish soldiers from all origins. I had the honour to be among these heroic fighters. After overcoming with them a painful captivity, I met again with them in the Resistance, where, with a same heart, they continued the fight against the hitlerian army, for civilization and for the independence of France. I thank you for the opportunity that you give me to express them one more time my friendship, specially at this time when one must join all those who resolutely oppose the renew of the German militarism and want to preserve the freedom and very existence or our nation. The general Joinville, friend of the foreign fighters has gone. General de Joinville, former chief HQ of the FFI just died at the age 48. Former adjudant in the 21st RMVE he knew very well the foreign volunteers, on the battle fields in 1940 as well as in the partisans groups. General de Joinville was present every time it was necessary to defend the rights of our comrades. In his message published in our book “ Au service de la France”, he said “ I thank you for the opportunity you give me to express (to the foreign volunteers) my friendship, specially at this time when must join all those who resolutely oppose the renew of the German militarism and want to preserve the freedom and very existence or our nation”. As one know, at the war declaration in September 1939, the committee of understanding of the veterans and Jewish volunteers of ww1 organized the recruiting of the Jewish volunteers. Thousands of applications were collected, among which an impressive number of foreigners. Sent to various instruction centers, they lived there in difficult conditions, and were sent to the front the most often poorly equipped and poorly armed. Nevertheless they fought heroically. As POW they suffered a lot from the Germans’ treatments, who refused to consider them as regular soldiers. For those who remained in occupef France, the anti-Jew prosecutions applied as well, and in many cases they were even more exposed than the other Jews, specially from the Vichy authorities; in the occupied zone as well as in the “free zone”. 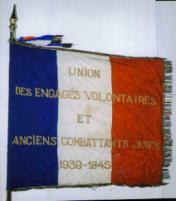 The “Union des Engagés Volontaires et Anciens Combatants Juifs” deserves to be complimented for having imagined to collect and record their heroic deeds, and describe their and the eminent role they have played by participating to the fight of the people of France for it’s independence. September 1939! War! The ominous word overrun the first pages of the newspapers, overturn the hearts of men and women tenderly attached to daily work, family joys, happiness and peace. To the bills who call for mobilization answered "ready" also those who found in France welcome and hospitality, and who sharing the fate of their fellow French, wanted to prove completely their loyalty to the adoptive nation endangered : the foreigners engaged for the lasting of the war. They were ten thousands, in Paris, and in the country, to put themselves spontaneously at the service of France, and, among them, like their memorable elders in ww1, thousands of foreign Jews, who came from different social horizons in a common impetus of brotherly union. After a few months of military instruction in the Barcares, La Valbonne, Septfond, and North African camps, these soldiers will form the 21st, 22nd, 23rd March Regiments of Foreign Volunteers (RMVE), the 11th, 12th, Foreign Infantry Regiments, the 13th half Brigade and numerous other infantry battalions. Also by thousands will they be integrated in the Czech and d Polish armies on the French territory , and in all the regiments of the Foreign Legion in Africa. All these regiments will win renown in many glorious combats on the different vital points of the front to which they will be hastily sent : Somme, Aisne, Ardennes and even to Norway at Narvik. As witnesses the many citations, collective and individual, the volunteers of these regiments will accomplish their duty with abnegation and exemplary sacrifice, to bar the way to the nazi armies. By thousands they will fall on all battlefields, defending freedom and keeping in their hearts the same love for their second fatherland. French soldiers foreign volunteers, they rest side by side in the huge military cemeteries, like symbols exalting their fighter's fraternity for the French cause. To all of them, with no distinction of origin, for their mixed blood spilled for her, France will keep for ever the same recognition. are extract from the book of the 10th and 25th anniversary of the association. Many books were dedicated to the WW2 history and to the victory of the allies over the nazi tyranny, few have written though about the eminent role played in France by the immigrants in the fight against the invader and quite nothing has been told about the contribution of the foreigner Jews who, by thousands stood up the very first day of the war to defend with weapons their adoptive fatherland.